This Is How You Leave The Dealership In Brand New DODGE HELLCAT! - Muscle Cars Zone! This Is How You Leave The Dealership In Brand New DODGE HELLCAT! Whenever you purchase a new vehicle, it is a special moment for you hence it becomes your belonging, something that you love and respect. This is especially true when you buy your dream car, the car that you always wanted to have. But there are some people who want to remember the moment they purchased the car forever, thus they perform or make some unusual thing. Hereby, we take a look at this video in which a man has just purchased this new Dodge Hellcat from the dealership, but then decided to show everybody the exact reason why he purchased the car. There was man outside who filmed the action hence he knew that something awesome was about to happen. There are also other people standing near the street. Every one of us wants to test out the abilities of such performance cars as soon as we get it, but this new Dodge Hellcat owner did not wait for even a second. 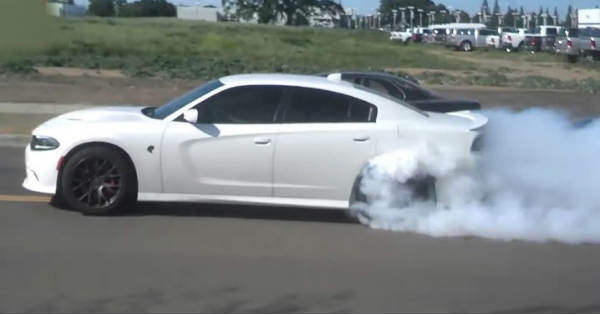 As soon as he got out on the road, the driver immediately started performing donuts, thus causing huge clouds of smoke coming out from the tires. One of the man who was standing nearby, decided to run away hence he thought that the Dodge Hellcat started losing control and was about to hit him. But, we can clearly say that the driver is an experienced one and knows his job. What do you think, is this one of the best ways to leave the dealership?